“I forgot to give you this…” proclaimed the 23 year-old electronic artist on Twitter, followed by a YouTube link. Is FlyLo working on new material already or is this just a b-side from Cosmogramma? Regardless, here’s the new Flying Lotus track. Check it out. Plugging away since 1999, The National finally hit mainstream success with the release of their 2010 album High Violet. 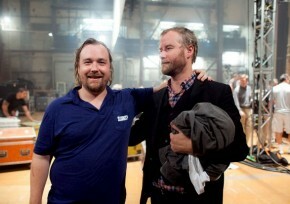 Of course, this entailed their first world tour, but in the new documentary Mistaken For Strangers, it’s only the backdrop for the relationship between lead singer Matt Berninger and his younger brother Tom, who had no idea that these short videos he was shooting would turn into a public document of their troubled, if still loving brotherhood. We talk with Israeli rockers Vaadat Charigim about some of their favorite records. We talk with Yvonne Ambree and Jesse Barnes of Take Berlin about some of the records which influenced the recording of their debut EP, Lionize.